I have never read a book on any subject that contained such a wealth of knowledge in a series of short stories by so many different writers. Dingoes Tails was the concept of Kane Guy a teacher, writer, husband, father of three, and absolute dingo admirer. 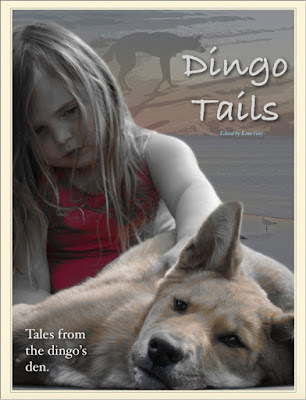 With the publication of Dingo Tails Kane hopes to paint a new picture of the dingo in the eyes of everyday Australians; that by the end of the book the reader will be able to see through the indoctrination of media sensationalism and appreciate the true beauty of the dingo through its many endearing and truly unique qualities. The stories often tell of an immense reciprocated love; of Dreamtime legends, of people breaking the law, battling differences in legislation between states and challenges of having a dingo in the home. They will make you laugh at dingo antics and ingenuity. They will make you cry with stories about the dingoes sensitivity and loyalty and through the verbal images of the cruelty the dingo has endured for over 200 years. Mostly they tell how beautiful and spiritual the dingo is and how it is different to a domestic dog. It contains beautiful and emotional descriptions of the love between dingoes and humans; at least those humans who take the time to understand and love an animal who could be described as the most misunderstood and maligned. The stories are not just written by people who live with dingoes or care for them in the wild and in sanctuaries. They are also written by environmentalists, scientists, overseas visitors and even a farmer who welcomes dingoes onto his property. They are all written by people who love dingoes. To take one quote from the book that summarises the emotion of living with a dingo: “To say we love dingoes cannot encapsulate our feelings for them.” Stories from Koru by Tanya Hancock. I know many people skip the Preface of a book and it is rare that I would make special mention of it in a review but, in this case it is essential reading. It introduces the Dingo as an Australian Native, its history since white settlement and the gradual war between graziers and the dingo. It discusses the still unsolved question of where dingoes originated from, their life and social structure, role as an apex predator, its important role in maintaining balance in the ecosystem and the need for a change in legislation to protect the Dingo. It is written in a fresh, easy to read style without rehashing the same old words and phrases. It is essential reading to start having an understanding of the Dingo. …… their warm eyes stare into your soul, communicating messages that can’t be spoken. It’s something incorruptible, something indelible, something ancient that has preceded us, yet something that we know full well. It’s a bond of partnership, a promise to always love and protect; to provide and share. A unique and enduring companionship that is as old as the hills in this land, as old as its first people. Legend since the Dreaming, the Dingo’s place has not changed in the wild hearts of the men and women who love them. Respected and admired, loved and appreciated, the bond and the spiritual exchange of unexplainable values are lifelong in its entirety, and moment by moment in its expression. Love is, with the Dingo, at the centre of all things. Love of freedom, love of life, love of family and love of duty and commitment. Loyal and faithful to their kin, to the death they prove their love. Ephemeral only is their beating heart, that one day will return to the earth from which it was made. But their love, their love is an icon in this rugged and tough land that proves to endure through all places, in all things, no matter the persecution or the ultimate cost. I sincerely hope this book gets into print. It deserves to be displayed in every book shop and every library. Maybe then Australia will wake up and accept the Dingo as a vital native animal of this vast country.